It was 20 years ago that Wayne State University senior Markita Terry last saw her biological mother. Although a drug addiction had forced the woman to surrender custody of Markita, she had stayed in contact with her baby girl as best she could — through spot visits and brief meet-ups. “I had been placed in a foster home when I was 4 after my mom got into a fight with a woman we were living with,” recalled Markita. “The police had been called and they took my mom to jail. They took me to an agency, then to an emergency foster home. The first year was rough, but Markita found joy and solace in weekly opportunities to meet up with her mom at a Detroit social services center. Whatever her struggles, Markita’s mom always kept their dates. Until one day, she didn’t. And with that, young Markita Terry — whose father had moved to California with her brothers several months before — lost her last tie to her biological family and tumbled headlong into the state foster care system for more than a decade. But despite spending her adolescence and turbulent teen years bouncing between multiple foster homes, dealing at times with instability, neglect and even abuse, she has soldiered on. Through it all — the loss of her mom, the birth of her own daughter, a brief move to Los Angeles to reunite with her father and siblings — the irrepressible communications major still found herself walking across the stage at the Wayne State graduation ceremony at Ford Field in May. This summer, Markita traveled to Italy through a WSU Study Abroad program. 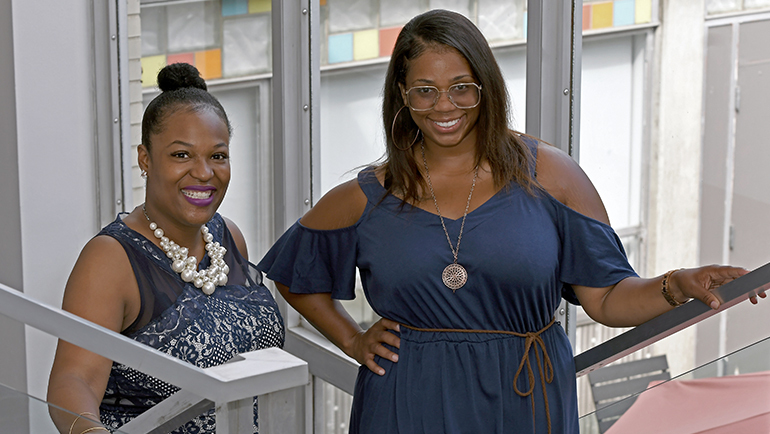 Airika Buford, the communications and outreach coordinator for CHAMPS, was perhaps the most instrumental university staffer in Markita’s orbit, and their relationship illustrates just how deeply the program embeds itself in students’ lives. Hired into the School of Social Work not long after Markita enrolled at Wayne State, Buford formed a fast bond with the then-sophomore. In fact, CHAMPS has been looking out for students like Markita since its inception. Run out of an unassuming office on the first floor of 5425 Woodward Ave., which sits adjacent to the Wayne State School of Social Work, the CHAMPS program has over its six-year existence become something of a safe haven for numerous Wayne State students who, like Markita, are healing from the struggles of turbulent upbringings in the state foster care system. Overseen largely by Judith Wineman, a lecturer in the School of Social Work, and Buford, CHAMPS furnishes a slew of wraparound services designed to help buoy students above the financial instability, housing insecurity and deeply rooted social challenges that confront almost all of them. CHAMPS students receive up to $5,000 in financial assistance each year, with every student receiving some level of funding. Students are also eligible for tutoring, career mentoring, life-skills training and help managing their foster-care cases. CHAMPS offers counseling for troubled students. The program has even allocated a small pool of money for student emergency funds, enabling CHAMPS a degree of flexibility to address specific student issues as they arise. The program was started in 2012 in response to a growing body of research that showed that foster children in Michigan had almost no chance to make it to, or through, college. Studies done in the past six years show that about 10 percent of foster children enroll in college — with only about 3 percent ever earning a degree. Worse, figures show that 60 percent of foster children who don’t attend college wind up sentenced to jail time, 40 percent experience either housing instability or outright homelessness, and less than half land employment. CHAMPS has been fighting against those trends since its inception, waging its battle by working with large groups of students as well as one enrollee at a time. “In the short term, we want to ensure that we maintain a strong mental health support for our students,” said Buford. “Our program has done a great job of creating a partnership with the College of Education so that our students can receive services in a trusted space: our office and drop-in center. I think that this partnership has been very effective for students who have taken advantage of it. And all along the way, the program is propping up students who might otherwise falter, not because they want to but because they often don’t know how to negotiate a path to success by themselves. “One of the biggest problems with being a foster kid going to college is the lack of support,” said Markita. “A lot of people have a mom and dad to be there if you get kicked out of the dorm room or don’t have anywhere to live. For former foster youth, you don’t have that… And coming out of foster care, you’re dealing with a lot of mental issues. You’re dealing with rejection, abandonment, with so many issues that aren’t dealt with for the most part. And CHAMPS is looking to grow not just its target group but the full university population. Wineman notes that CHAMPS is looking to help the university create pathways for a broad diversity of students, beyond even just foster care youth. Meanwhile, as CHAMPS continues to see positive outcomes, it’s earned broader support from the university community. Buford and Wineman pointed out that, while other universities may have programs for foster care youth, few integrate those services into the overall college experience. In that regard, Wayne State — and CHAMPS — stands out. “My advice for foster care students who want to attend college is to make sure you are informed,” said Buford. “Although there are plenty of resources for foster youth for post-secondary education, it is not free. The cost can be minimal but ask all of those questions before selecting a school. And for many of those successful Wayne State students who’ve teetered between triumph and trauma, for young people like Markita Terry and many others, CHAMPS has often provided the winning edge.